Here’s part of a message I wrote to a friend, who has an 11 month-old with NO teeth, and is trying to figure out some non-milk ways to add protein to his diet. For little ones, this sounds a little crazy, but I like serving beans. Of course, too much beans will make anyone gassy… But a small amount is a great source of protein. Garbanzo beans are the least gassy of all beans and have a very mild flavor that is appealing to most babies. If you can find them, old-fashioned metal ice cube trays that feature a little loosening bar/contraption work even better. Also, you can use a blender or mini food processor to mash up beans and even meat. It’s really easy, actually, to make your own baby food. Put some cooked brown rice, some cooked beef (stewed works well), some cooked garbanzo beans, and some spinach — raw or cooked — into the blender (or some other healthy combination you think he’ll like — cooked squash, chicken, oatmeal is another idea, or plain yogurt*, blueberries, and oatmeal) and blend to process. Put it in an ice cube tray, and when frozen, pop out and put the cubes in a Ziploc. Then you’ll have quick little portions. I’ve even saved store-bought babyfood jars, and in the a.m., put 2-3 cubes in the jar in the a.m., and by lunch time, they’re thawed and ready to eat. When I make babyfood, I will often just set aside an unseasoned portion of whatever I’m making for the family either to grind up for baby’s dinner that night OR I’ll save brown rice one night, beef the next, squash the next, etc. and then when I have small bowls in the fridge of a good babyfood combo, I will put them in the blender and make the babyfood. I do that, though, because I’m cheap + healthy. Gerber and Beechnut typically have so many crappy additives, especially in the stage 2 & 3 meals, but the organic baby food is SUPER expensive. 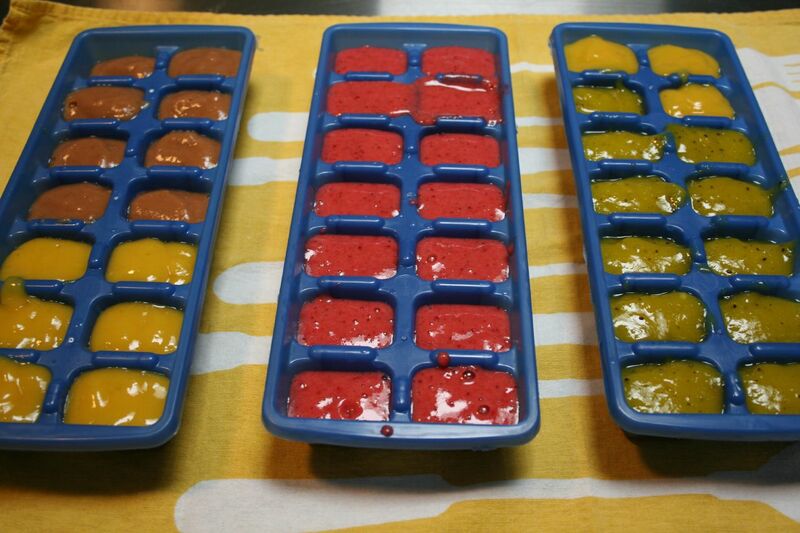 And once you get in the habit, it literally is about five minutes extra of your time to make and freeze babyfood cubes. For babies younger than 11 months, it’s even simpler, as you should only use one food at a time — steamed carrots, baked squash, etc. When your baby is around 7-8 months, they can usually tolerate a simple combination of two foods at a time. The older they grow, the better able they are, typically, to digest more complex food. Making your own babyfood is more trendy than when I started to do it, nearly 15 years ago. Responding to consumers, the are now a number of babyfood cookbooks, “kits”, and other supplies… Although I love cookbooks and kitchen gadgets, I find most of that stuff to be kind of a waste of money. Just take plain versions of what YOU eat — provided that you eat healthy, whole foods — and prepare it as babyfood. Voila! No cookbook needed. And if you have a blender or a mini-prep food processor and some ice cube trays, you don’t need any special gadgets. *And, yes, I know I just said “non-milk” and there was a reference to yogurt in there. It appears that her little one MIGHT have a sensitivity to milk — but milk sensitivities can be tricky. Is it just lactose? Lactose is milk sugar. In honest, fully cultured yogurt, there is virtually no lactose; the yogurt cultures “eat” the milk sugar, and the resulting fully cultured yogurt has no lactose. Same with hard, aged cheeses — like cheddar. The process eliminates lactose. But, if a child has a sensitivity to casein or whey or another milk protein, you’re up a creek, and even yogurt won’t help; you have to quit all milk products altogether. 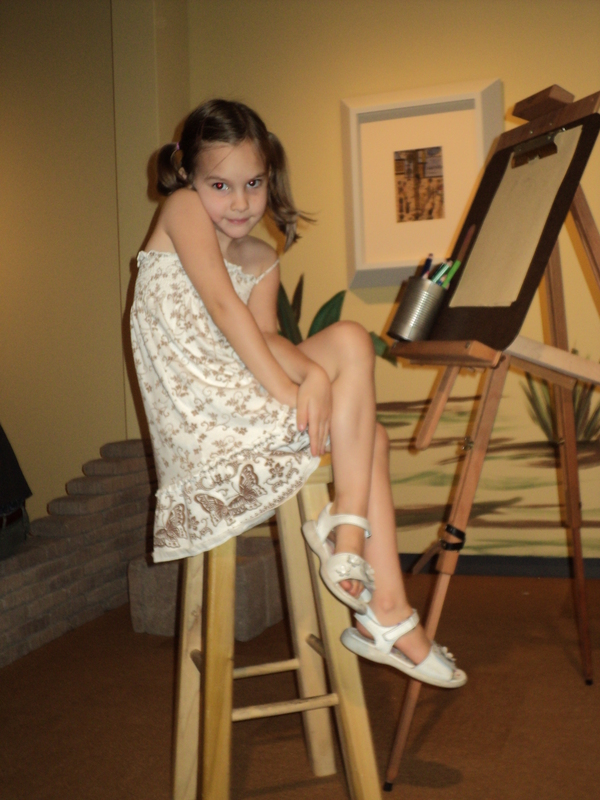 Do you live in the north Glendale area of Arizona? Are you looking for some weekly, inexpensive, naturally-grown produce to add to your health and palate??? 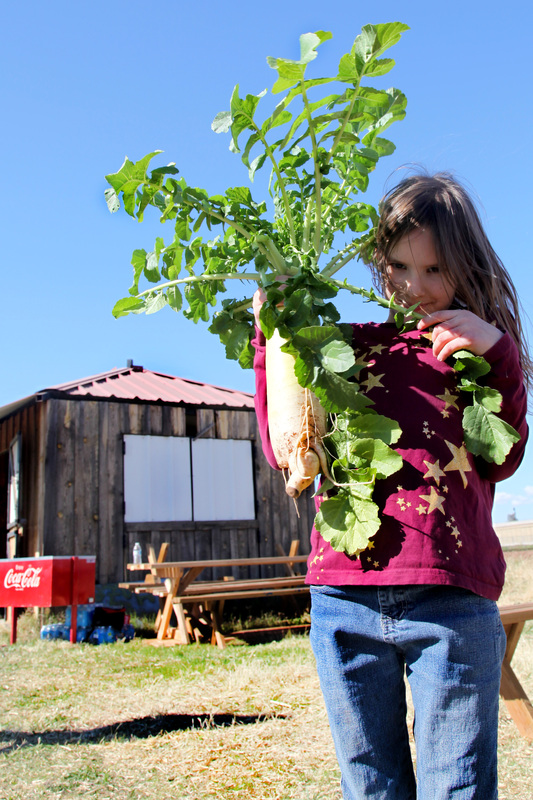 The Crooked Sky Farms CSA is ON!!!!! The cost is $20 per week for 12 weeks. We will start on February 13. Pick up is at my house from 3:00 – 5:00 every Wednesday. Produce is Certified Naturally Grown, which has higher standards than USDA Organic and is more appropriate for small, direct-to-consumer farms. Pay in full in advance or half up-front (on or before February 13) and the other half midway through. Send me an e-mail at karenjoy@onlysometimesclever.com if you are interested and I will send you a contract and an info sheet later this week. If you decide it is right for you and your family, let me know soon and I will add you to the list!! I’ll admit it: I crave junk food from time to time. Lately, what has been haunting my wishful ponderings has been the sickly sweet orange chicken dish, found at “fast casual” Chinese restaurants, like Panda Express. I last had Panda’s orange chicken more than ten years ago, and I still remember… If there was a gluten-free version sold somewhere, I’d probably gobble it up. So, perhaps it’s best for my sugar-intake that I haven’t found it anywhere. A couple of days ago, a bloggy friend sent me a recipe for Crockpot Honey Sesame Chicken from The Comfort of Cooking. Perhaps you’ve seen it; it’s been making the rounds like wildfire, thanks to some fabulous pictures and Pinterest. I looked at it and thought, “That is a LOT of honey.” I buy semi-local honey, from The Honeyman in Prescott Valley, Arizona. It’s raw, thick, and amazingly delicious. It’s also expensive. My thought was, “A cup of honey is worth roughly $2.75.” I’m sorry, but that’s too much invested, honey-wise, into one recipe. I also thought, “Two pounds of chicken? That’s not going to feed my family.” Along those lines, my friend Tina mentioned that she had doubled the chicken and the recipe had still turned out well. And then, I looked in my freezer and saw a half container of orange juice concentrate that I keep specifically for cooking. The gears in my brain, especially the ones marked Fiddling with Recipes, started whirring. 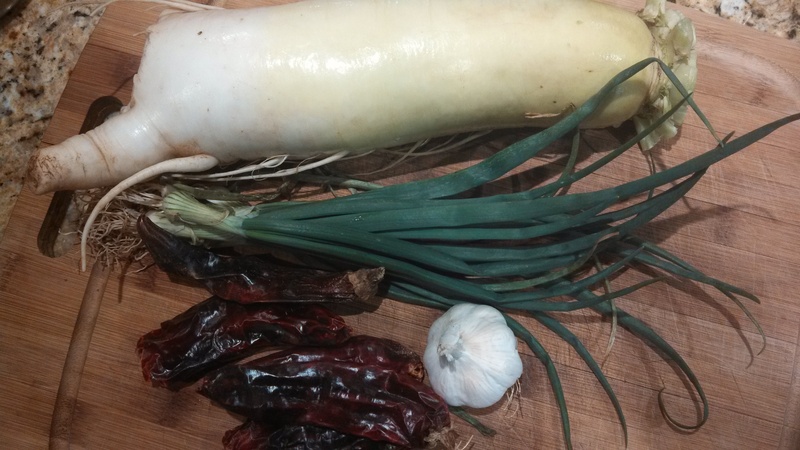 And the resulting recipe was so different than the original that, while I freely admit I used it as a launch pad, I thought I could probably safely call it a new recipe. The resulting recipe was also AMAZING and TASTY. When I sampled the first completed spoonful, I about melted. So perfect. So, so perfect. Granted, it’s not as sweet as Panda’s orange chicken; I think you’d need to throw in two or three cups of sugar to accomplish that. However, it’s orangey-enough and sweet-enough to satisfy the cravings. 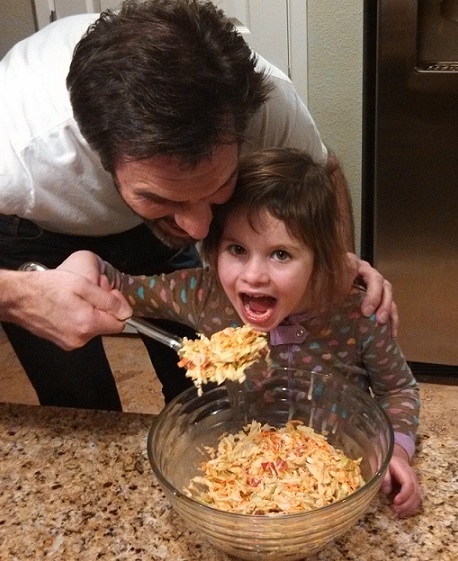 I was a bit afraid that it would be too spicy for my little girls, ages 4 and 6. They made comment about the spiciness, but each of them simply picked up a cup of water and braved their way through, as the flavor was compelling enough to keep eating. Everyone — all seven of us — really loved this recipe. It received thumbs up and requests for me to make it again in the future. One more recipe note: You may notice that ½ teaspoon of citric acid is called for. “Wha…?” may be your response and you may be tempted to omit it. PLEASE DON’T. Let’s call it the Secret Ingredient. Citric acid enables you to taste the tang of the oranges. It’s a must. If you have a Sprouts in your area, you can find it in the bulk spice section for less than a dollar per ounce. It can also be found in the canning section of any well-stocked grocery store. Or, if you have a cheese-making store nearby, they will certainly stock it, as well. OK. One more recipe note: The only mixed reviews were about the cooked orange peel in the recipe. Some loved it, some picked them out. 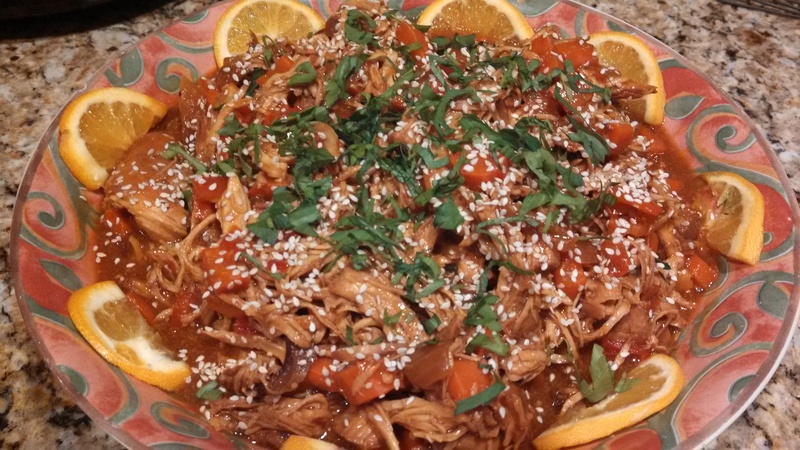 Spicy Orange Chicken (Crockpot, GFCF) In this pic, instead of green onion, chopped Italian parsley tops the dish. I went to my veggie drawer which was inexplicably bare of the staple. I did find some parsley, though, and it tasted fine and was pretty. However, I do suggest you use green onion. 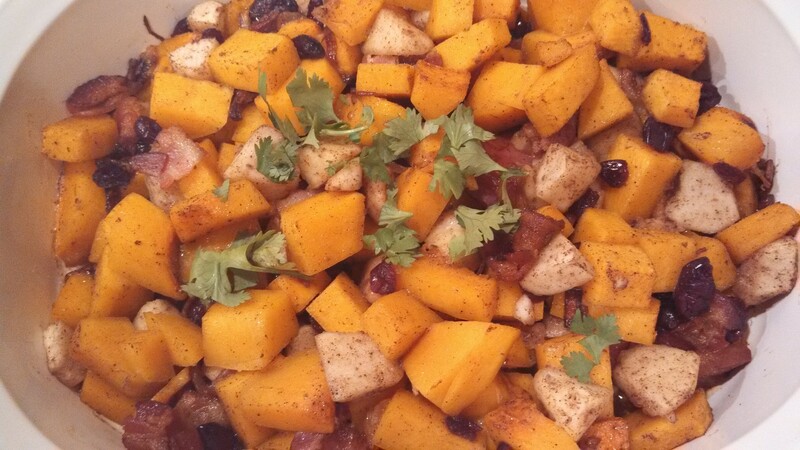 Click here for a printable PDF of the recipe. Cut chicken pieces in half, lightly season with salt and pepper, and place in the bottom of a Crockpot. Turn Crockpot on high. Chop onion and place on top of the chicken. In a glass bowl, gently heat honey in a microwave until thin. (Alternately, you can place the container of honey in a pan of hot water until warmed through.) Into the warmed honey, whisk the orange juice concentrate, tomato paste, apple cider vinegar, minced garlic, soy sauce, and red pepper flakes. Pour atop the chicken and onions. Cover and cook on high for two hours. Slice the orange in half, and slice each half very thinly. Set aside half of the slices for garnish. After the chicken has cooked for two hours, add the remaining slices to the simmering chicken, stirring to mix. Turn Crockpot to LOW. Cook for one hour. After the chicken has cooked for an hour (for a total of three hours), the chicken should be very tender. Break up the pieces, still in the Crockpot, with a wooden spoon. In a small bowl, mix 1/3 cup water, the corn starch, and citric acid, combining well. Stir into the simmering chicken, mixing well. Then, stir in the chopped carrots and red bell pepper. As brown rice needs to cook for about 45 minutes, start it now: In a medium-sized saucepan, combine the brown rice and four cups of water. Bring to boil, then cover and turn heat to low, simmering the brown rice for 45 minutes. Continue to cook the chicken and veggies on low for an additional hour (a total of four hours), stirring occasionally, breaking up more chunks of chicken as you stir until you have a shredded consistency, as in the picture above. Ladle shredded chicken, veggies, and sauce into a serving dish. Garnish with the remaining orange slices, sesame seeds, and chopped green onion. Serve over hot, cooked brown rice. You may just have to believe me that this is an excellent recipe. 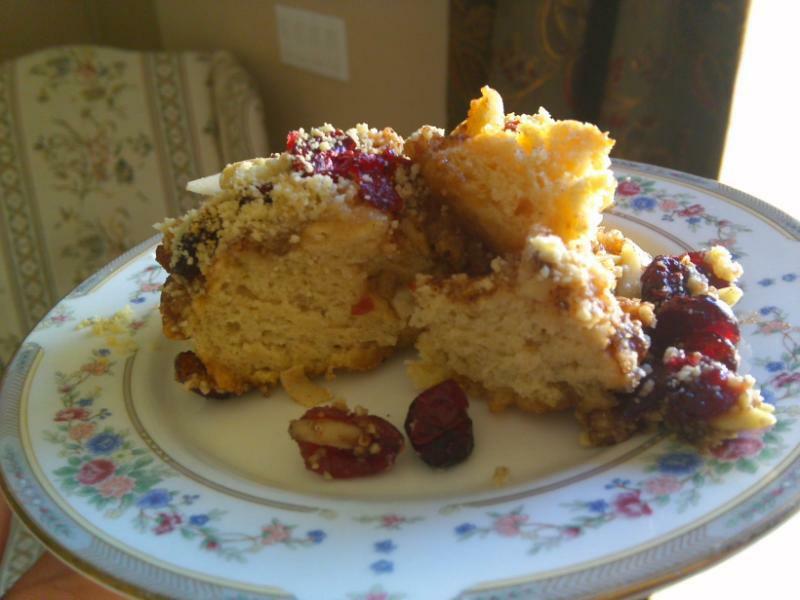 I have five children, and it is challenging to find or create a recipe that EVERYONE loves. However, all seven of us were fighting over who could have thirds of this. (In the end, no one had thirds. We saved enough for my husband to take to work with him the following day with his lunch.) My six year old, Audrey, who is not a particular fan of cabbage said, “You know what makes the red bells and the carrots and the cabbage taste so delicious? It’s the sauce.” I thanked her for her excellent review, and decided that I would post this recipe, even without a Pinterest-friendly photo. Indeed, “the sauce” is what makes this slaw taste wonderful. It has a flavor that is classic enough to make it taste like “real” coleslaw, but healthy enough that you may never again return to sugar-laden slaw again… I have made our slaw like this for years, with no regrets. Into a glass container, measure the honey. Warm (in either a pan of hot water or in the microwave) the honey so that it is thin. While still warm, whisk in the lemon juice. When incorporated, whisk in the dijon mustard, salt, and pepper. When incorporated, whisk in the mayonnaise until the dressing is smooth. Gently fold in the red bell pepper, carrots, and cabbage. A new-to-me gluten-friendly, family-friendly place to eat!!! Our family eats out about once every two weeks. We have a slim selection that is gluten-free, stuff everyone will eat, and isn’t too pricey. I got an ad in the mail for a nearby place — Genghis Grill, a Mongolian-style barbecue. The food looked good, so I went on the website. It was hard to find, but I eventually stumbled on a PDF that, among other things, lists the ingredients for all of their sauces. Three of them (Sweet & Sour; Dragon — which is a sweet & spicy chili-garlic sauce; and Roasted Tomato) are listed as “gluten-friendly” — meaning they have no gluten ingredients. I thought, “Great. But what about the meats? And the veggies?” so I contacted the company. They called me this morning — a GREAT customer service rep named Jax — turns out she is the Director of Culinary R&D — and she said that the ONLY meat that has gluten is the “Khans Krab” (it’s imitation made from fish and wheat starch — no surprise there). None of their meats, marinades, veggies, etc., have gluten. They don’t use soy sauce (which almost always contains wheat) in any of their marinades, though it is present in their fried rice and in their gluten-containing sauces. She also said that if you let them know that it’s for a “food allergy”, they will clean the grill AND use a clean wok AND even cover your food while it’s cooking with a bowl to limit cross-contamination. In addition, all of their spices are “clean” — 100% spice, no fillers like maltodextrin or starches. Jax said that they take food issues seriously. I really appreciate that. They are very aware of the potential of cross-contamination, so they don’t make the claim of 100% gluten-free, but I REALLY appreciate the efforts they’re making, and you can be sure we’ll be eating there some time in the near future. So, you could use white or brown rice, ANY protein (minus the “crab”), ANY vegetable, and one of three gluten-friendly sauces. In the limited world of g.f. eating, that’s actually quite a selection. Additionally, unless I’m missing something, all of the sauces that are gluten-free are also dairy-free. I think all of this will compel me to ignore the “cutesy” spellings using “Khan” throughout their website and menu. Do any readers have experience with Genghis Grill? A while back, when I embarked on a no-sugar Paleo-ish diet, I looked high and low for honey-sweetened chocolate for an occasional treat. I was pretty aghast to find that the prices of such chocolate are typically around $3-4 for a one-ounce bar. ONE OUNCE. Plus shipping. I couldn’t find any locally. That was a no-go. $64 a pound doesn’t work on this budget. At Trader Joe’s on Thursday night, I stopped by their “new products” display and I think I gasped aloud when I saw the above package. Then, I started to hyperventilate. Well, not really, but I was really excited. When I got to the car, I sampled. 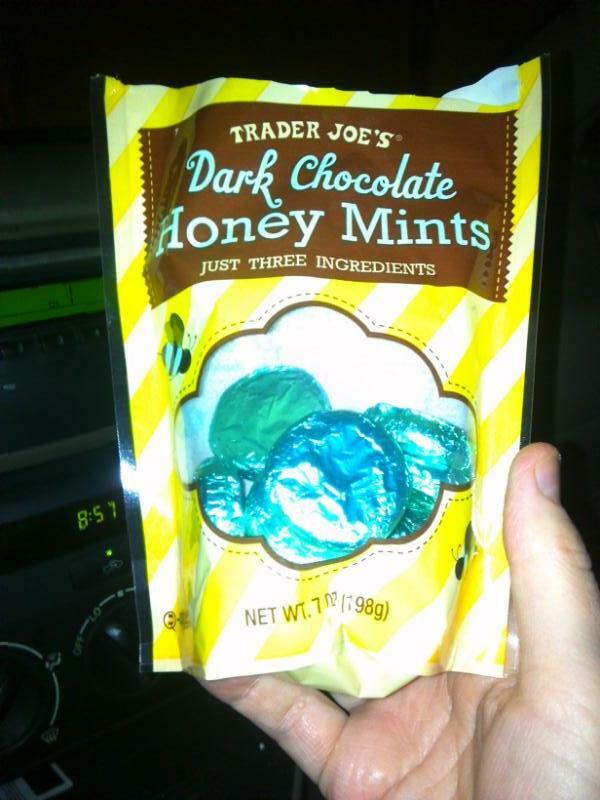 These Dark Chocolate Honey Mints are SO GOOD. They’re like junk-free peppermint patties, and an absolute dream for anyone who loves dark chocolate. They’re $3.99 for a 7 ounce package, which isn’t cheap, but compared to all other honey-sweetened chocolate, and many chocolates in general, not unreasonable. That works out to $9.14 per pound. I can work with that. My package contained 16 good-sized candies. Per the nutrition info, there are 21 g carbs (17 g sugar, 2 g fiber) in three chocolates. Not hyper-low-carb, but definitely workable for any reduced-calorie or reduced-carb diet. As the package front proclaims, they have only three ingredients: honey, chocolate liquor, and oil of peppermint. The inside is a creamed honey flavored with peppermint. This means that whether you’re gluten-free, dairy-free*, vegan*, vegetarian, refined-sugar-free, or on just about any hyper-restrictive diet, you can eat these. In fact, one of my first thoughts was for a dear friend: one of her daughters is on the Feingold diet, another is gluten-free and dairy-free. I stopped by her home with the world’s smallest gift: Five candies, one for each family member. 🙂 I should have purchased a whole package for her; I was kicking myself for not doing so. But, knowing that candy that fits the diets of her daughters has been really tough to find, I had to share, at least a little. The look on the face of her oldest daughter — the one on Feingold — is imprinted on my memory. She was SO THRILLED. For someone who normally can’t have candy, these chocolates are like GOLD. Another thought was for my Paleo-inspiration, Kim. I sent her a text and a pic, and she was excited too — she shops at Trader Joe’s all the time and hadn’t seen them before! Having Paleo-friendly chocolate is a rare, rare treat. The only drawback is that the chocolate itself is wholly unsweetened. It’s plain, pure, dark chocolate, and all the sweetness comes from the creamed honey center. So, you really have to chew these to eat them, or it tastes like you’re licking a square of baking chocolate. I prefer to savor my chocolate slowly, and don’t usually chew. But… I kind of have to make an exception here. Small quibble. I had planned on eating one a day, but here it is, about 48 hours after I purchased the bag, and they’re all gone. Now, I did share with my friend, and gave one to my hubby, and one to Fiala… But, uh, that means I ate nine of them in two days. That’s not sustainable — too much sugar for me, even if it’s sugar from honey. So, the next package I buy, I’ll have to ration it more carefully. So, y’all go out and buy some, so Trader Joe’s will keep this product on their shelves forever. Here’s another review, with a bit more info. *the package does warn “may contain traces of milk”. This is my favorite sauce. Truly, I could just ladle it into my mouth with rude slurping sounds, but I usually restrain myself and put it ON something. 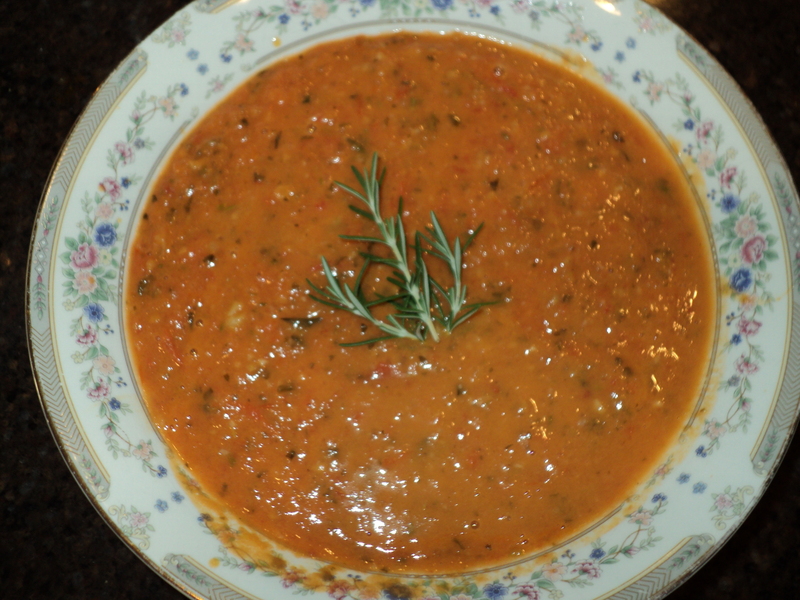 It works as a pasta sauce or a topping for steamed veggies, baked fish or chicken, or just about any meat. Or tofu. It would make tofu taste good, I’d bet, which is an admirable feat for any sauce! You can serve it straight up, but since it is concentrated and PACKED with flavor, I will sometimes sauté chopped veggies on the side — zucchini or other summer squash, mushrooms, and red bell peppers are good choices — and stir it into the confit, with perhaps some canned (or fresh) diced tomatoes, to extend the sauce. The result of this recipe is somewhere between a sauce and a condiment. I think it would make a fabulous topping for bruschetta, and the other night, when I served this, my husband (who is much more keen on presentation than I am) said, “You could just make a schmear of this across a clean plate, and serve the fish on top of it.” Good idea, especially as this highly-rated flounder recipe didn’t turn out quite as flavorful as I had imagined. The ingredients are fairly flexible, depending on how much you have on hand, but here are the non-negotiables: Tomatoes, onion, garlic cloves, fresh herbs, olive oil, and sea salt. What transforms these usual suspects of the culinary arts is ROASTING them. A reader, who is also a Facebook fan, suggested — oh, about a year ago, I think — that I try making “confit” from my tomatoes. I had not enough to make paste from, but too many to just use in salads and sandwiches. She said she got the idea from Martha Stewart, who does indeed have a Tomato Confit recipe. However, I have tinkered and perfected, and now what I do hardly resembles the original, so I think it is transformed into something NEW, and even better. Although I might hesitate to label this as a true confit — that is, I really do not know how long this would last, as a preserve — it still bears its confit roots. The best part is: IT IS SO EASY, and it makes your home smell like a pizzeria, without the actual pizza. 🙂 Speaking of, this sauce doubles as pizza sauce that is to die for! As you prepare the ingredients, preheat oven to 325°F. Into a 11″ x 7.5″ (or similarly-sized) glass or glazed stoneware baking dish, drizzle about 1 Tbsp of the olive oil and sprinkle 1 Tbsp of the fresh herbs. 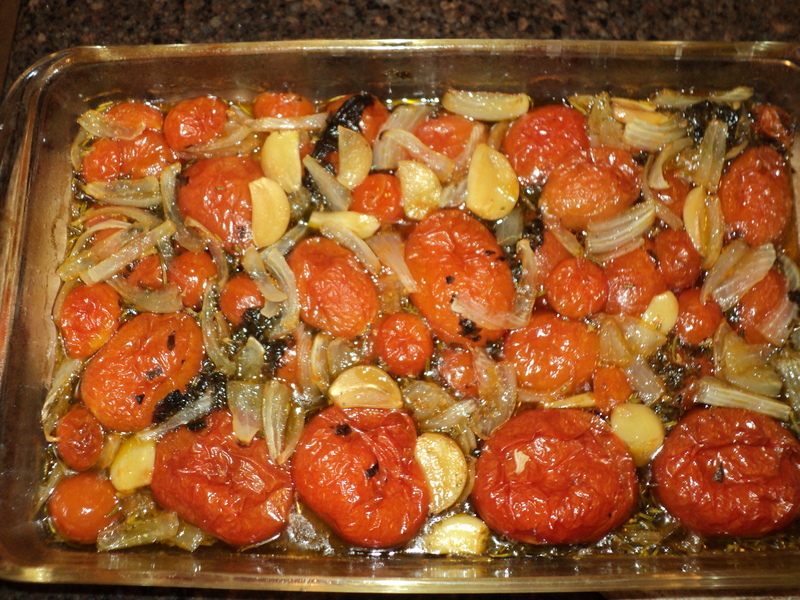 Place tomatoes, cut side down, shoulder to shoulder in the baking dish. They can overlap somewhat, but it’s best if they are all skin-side up, cut-side-down. Sprinkle the tomatoes with the rest of the herbs, the slivered onion, and garlic. Drizzle with the rest of the olive oil, then sprinkle on the sea salt and very lightly sprinkle all with a pinch of sugar. Bake, covered with foil, in a 325°F oven for 45 minutes on a mid-to-low oven rack. Then, remove the foil and continue to roast, uncovered, until everything is soft, and about half of the liquid has evaporated. Cool to room temperature (or until at least not-hot), and transfer all to a food processor or blender. I use a Cuisinart Mini-Prep, and pulse back and forth on chop and grind (I have to do it in two batches, as the bowl doesn’t hold the whole recipe). Process until the sauce is mostly-smooth, but not uniformly so. You want to be able to see the flecks and small bits. Taste, and decide if it needs more salt or even some pepper (I’m not a big fan of black pepper), then restrain yourself from eating all that concentrated deliciousness, right there.